SURFACE CRUISING. One of the big Thames class submarine cruisers, each of which cost over £500,000. The displacement is 1,850/2,710 tons, and the dimensions are 325 feet by 28 feet by 13½-13⅝ feet. They have electric motors designed to give 10 knots submerged and Diesels to give 22½ knots on the surface. Armament consists of one 4-in gun, two machine guns and six 21-in torpedo tubes. 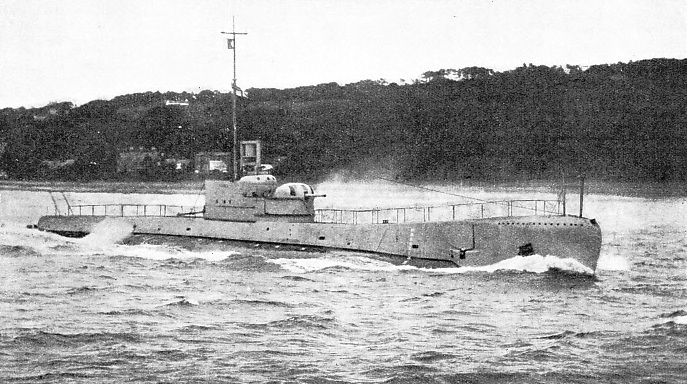 HMS Thames, from which the class takes its name, was the first submarine to exceed 21 knots, and after her trials made a passage from London to Venice at an average speed of 17 knots. OVER thirty years have passed since submarines were first used as effective weapons of naval warfare, yet to most- people they remain mysterious and sinister vessels. Because of this, no doubt, they attract more popular interest than any other type of man-of-war. The long queues of sightseers who wait patiently to board a submarine during Navy Week bear witness to this interest. But apart from the submarine’s purely mechanical power of concealment under water, which impresses the imagination, there is nothing marvellous about the vessel. The submarine is neither more nor less than a surface vessel endowed with the ability to submerge herself on occasion. A submarine normally spends most of her time on the surface of the sea, as does any other ship. She dives only to conceal herself, either for the purpose of attack or to evade pursuit. The cruising radius under water of even a large submarine is limited to a hundred miles or so. She can, however, remain motionless on the bed of the sea for periods up to three days, according to the size of the vessel and her supply of “potted” air. In spite of attempts to abolish the submarine on humanitarian grounds, this type of warship remains in official favour as a weapon formidable both in offence and defence. At the time of writing the leading seven navies of the world possess between them 447 submarines, of which the great majority have been built since the war of 1914-1918. The largest submarine is the French Surcouf, of 2,880 tons surface displacement, and the smallest the Finnish boat Saukko, of only ninety-nine tons. A further hundred are distributed among the secondary naval Powers. The modern form of submarine is the joint product of an Englishman, an Irishman and a Frenchman: Robert Whitehead, John Holland and Maurice Laubeuf. 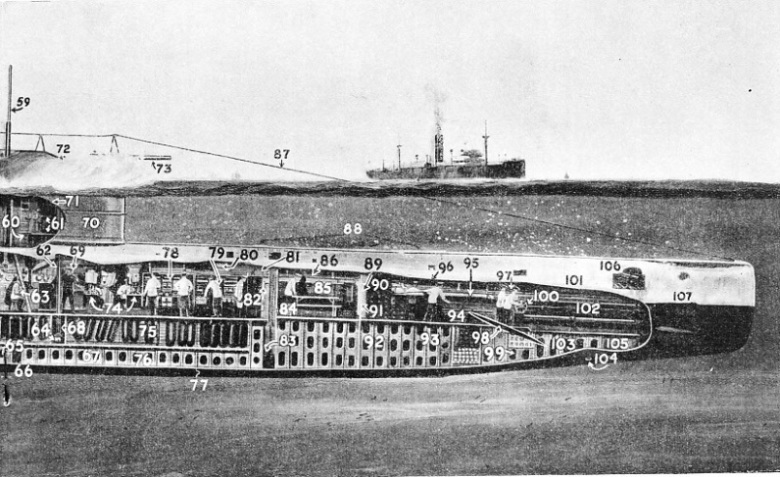 Whitehead, by evolving and perfecting the locomotive torpedo, provided the ideal weapon for underwater attack, and rendered inevitable the development of a vessel for carrying the torpedo into action. Holland and Laubeuf, working independently, availed themselves of the experience of earlier but little-known pioneers. They evolved designs of which the main structural features are amalgamated and embodied in the modern submarine. The submarine is a cigar-shaped vessel fitted with tanks into which sea water is admitted to reduce buoyancy to vanishing point. When the tanks are full the vessel either sinks of her own accord, or is driven under by the combined action of the electric motors and the “hydroplanes” (horizontal rudders). A speed of at least four knots is necessary before these rudders can come into play. But once the submerged vessel is under their control she can be steered to, and kept at, any depth within the safety limit. This limit is fixed by the capacity of the vessel to withstand the water pressure on a submerged object. The pressure is about 45 lb. per square inch for every 100 feet of depth. On a medium-sized submarine, one of 800 tons, the external pressure at a depth of 300 feet is about 155,000,000 lb. The maximum depth to which a submarine is known to have descended is slightly over 400 feet. Only a strongly-built vessel could withstand the pressure at that depth. If she dived deeper she would risk being crushed after the fashion of an egg-shell. To bring the submarine to the surface after a submerged run, the diving rudders are set at the correct angle. The vessel is then forced upwards by the thrust of her screws. When she has reached the surface, the sea water is expelled from the tanks by compressed air, thus restoring her normal buoyancy. Compressed air for “blowing” the tanks and for other purposes is stored in steel flasks at a pressure of 2,500 lb. per square inch. In most submarines there are several high-pressure compressors for replenishing the air flasks. All modern submarines are propelled on the surface by heavy-oil motors of Diesel type. But as soon as the vessel is submerged the Diesels are cut off. If these engines continued to run they would exhaust the air inside the hull in a few seconds. Hence electricity is the only practicable prime mover for underwater propulsion. Electric motors are, therefore, coupled to the propeller shafts and are switched on immediately the Diesel engines stop. These motors draw current from a series of storage batteries which, because of their great weight, are stowed in the bottom of the vessel. The batteries can be recharged from the motors, acting as generators, driven by the Diesels. But as the Diesels cannot be run when the boat is submerged she must come to the surface for recharging. The disadvantages of this dual system of propulsion are excessive weight in proportion to total horse-power and mechanical complexity. But the problem of finding a method of single-drive for submarines has not yet been solved. The great weight of the batteries makes an all-electric vessel impracticable. On the surface a submarine is steered and navigated in the same way as other ships. Submerged, her only “eye” is the periscope, the optical principles of which are too well known to call for description. From the interior of the vessel this instrument can be raised to a height of about 30 feet. When, therefore, the vessel is submerged to a depth exceeding 30 feet, she is deprived of all vision and must be navigated “blind”. Methods of sound signalling below water only partly compensate for this complete lack of vision. Not only does the periscope serve as an “eye” when the vessel is running submerged “at periscope depth”, but it is used also as a range-finder and sighting apparatus for the torpedo tubes that constitute the submarine’s main armament. Six to eight tubes are fitted in the modern submarine of average size. Most of them are in the bows of the vessel. The outer end of the tube is sealed by a watertight cap which can be opened or closed from inside. Before the torpedo is fired the tube is flooded with water from a tank, and the outer cap of the tube is then opened. While these preliminaries are being completed, the officer at the periscope has been manoeuvring his vessel into position for attack. This may take hours. The submarine’s speed below water rarely exceeds ten knots, and it is often difficult to calculate through the single eye of the periscope the speed and course of an approaching ship. In fact, accurate torpedo practice from a submarine requires a high degree of skill fortified by lengthy experience. When the sighting wires of the periscope bear on the target, the officer presses an electric button which controls an air chamber in the rear of the torpedo tube. The torpedo is then ejected from the tube by compressed air. As the torpedo passes out, a lever on the upper side is pulled back by a trip-catch in the tube. This action starts the engines of the torpedo, the tandem propellers of which are already revolving at high speed by the time it is clear of the tube. The speed of a torpedo set for short range may be as much as fifty miles an hour. Guns are now universally fitted to submarines, but they will always remain auxiliary weapons, chiefly for use against non- combatant enemy ships. No submarine commander would engage in a gun duel with a regular warship, as a single hit on his vessel might either sink her outright or destroy her capacity for diving. A submarine that cannot submerge is easy prey for hostile warships or aircraft. Despite their relatively small size, submarines have a large radius of action on the surface, because of the economical running of their Diesel engines. A vessel of 1,000 tons may have a cruising endurance up to 12,000 miles, but it is doubtful whether the crew could endure the strain of so long a voyage in war conditions. Cramped living quarters, constant “tinned” air and few facilities for exercise undermine bodily and mental fitness. During the war of 1914-1918 a large German submarine cruised to the South Atlantic and was absent from her home base for nearly three months. This is believed to be the record for a war-time voyage. It is sometimes claimed, but not by naval men, that the submarine menace has been defeated by the evolution of counter-tactics. There is little substance in that claim. There has, it is true, been a marked development in methods of locating a submerged submarine and of attacking her when found. But these methods are not infallible, and are unlikely to become infallible. Passive defence has been strengthened by fitting ships with “bulges” (false outer hulls) to absorb the shock of exploding torpedoes. But since all recent battleships and cruisers are provided with bulges, or other special forms of underwater protection, it is evident that the submarine is still regarded with respect. At the beginning of 1936 the British Navy had fifty-nine submarines, including nineteen that were built during the war. Modern British submarines are of three types - submarine cruisers, of 1,520 to 1,850 tons, several of which are minelayers; “oversea” or patrol vessels, averaging 1,475 tons, and “coastal” vessels of 640 to 670 tons. The submarine cruisers Thames, Severn and Clyde, with a speed of over twenty-two knots, are at present the fastest undersea craft in existence. The coastal vessels are built for quick diving and are reported to be able to submerge in thirty seconds. Below is a sectional diagram showing the general lay-out, compactness and interior design of a submarine. The numbers of the accompanying key refer to those on the picture, which shows the crew at their various stations as the submarine dives below the surface. At the lower end of the periscope the captain is observing the movement of the other craft and watching for any obstacle. By the control wheels of the hydroplane or diving rudder the First Lieutenant can be seen standing near two operators. As the Diesels that drive the vessel while on the surface are now shut down, artificers are giving the machinery a brief inspection and overhaul. Other ratings are standing by the electric motors, farther aft, which drive the submarine when cruising below surface. At the fore end, members of the crew are attending to the main torpedo tubes that are the submarine’s chief weapon; she alos carries a quick-firing gun. There is another torpedo tube near the stern of the vessel, and a large space is reserved here for the stowage of the torpedoes themselves. Near the captain a sailor is standing at the vertical rudder steering-wheel. 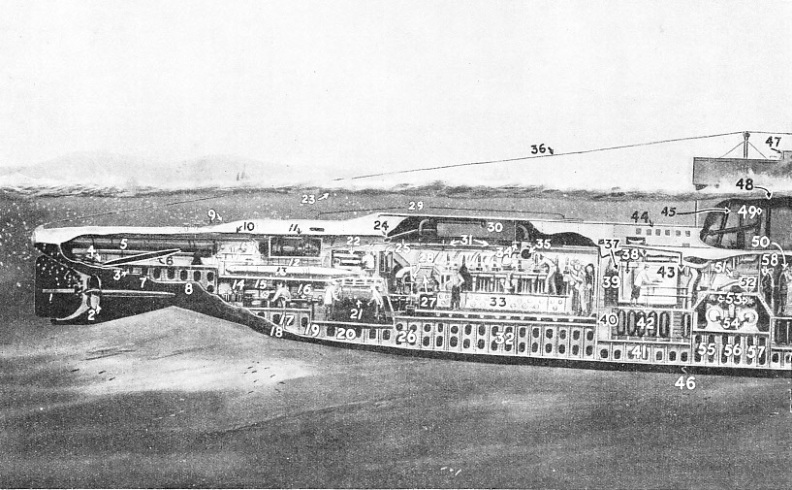 The submarine shown here is about to submerge completely; before doing so all the hatches are closed and the wireless masts are lowered. Submerging is carried out by moving the forward hydroplanes downwards and the after ones upwards. This cause the nose of the craft to drop and the submarine glides easily below the water. While cruising at a moderate depth a foot or so of the periscope is visible above the surface. Ventilation and the necessary supply of fresh air are obtained by fans and air trunks. Lockers; 95 Torpedo; 96 Fore Torpedo Flat and Crew’s Space; 97 Men at Bow Tubes; 98 Forward Hydroplane, or Horizontal Rudder; 99 Torpedo Tube Flooding Tank; 100 Wheel for Controlling Torpedo Tube Doors; 101 Sperm Oil Tank; 102 Torpedo Tubes; 103 Compensating Tank; 104 Hydrophone; 105 Forward Trimming Tank; 106 Anchor; 107 Torpedo Tube Doors or Shutters. You can read more on “Epics of the Submarines”, “Raising a Submarine Minelayer” and “The Unlucky K 13” on this website. 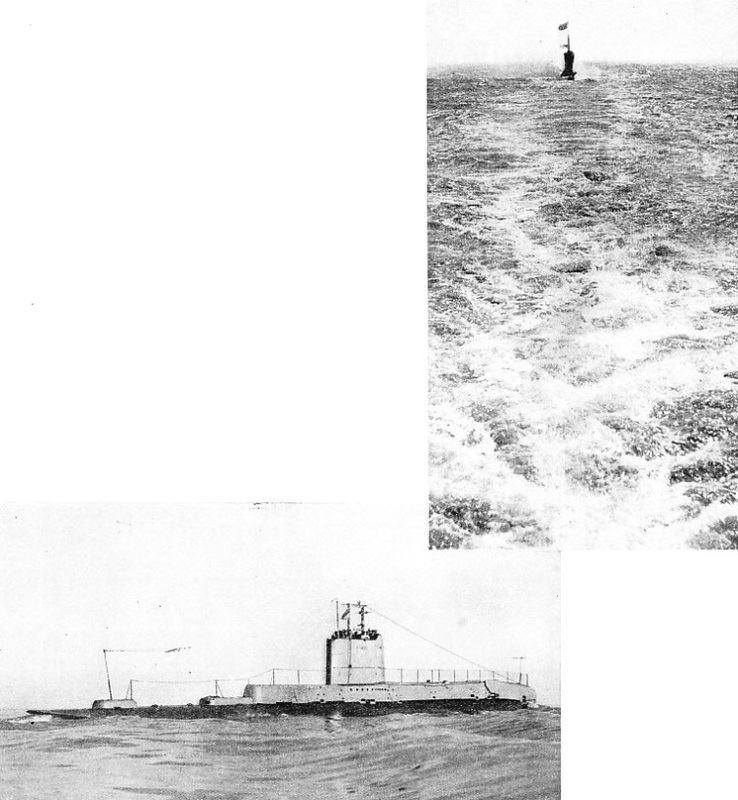 DURING MANOEUVRES (top) a submarine speeds along the surface leaving a wake of disturbed water. Below is a coastal type submarine of the Swordfish class. Her surface displacement is 640 tons and submerged 935 tons; length between perpendiculars is 187 feet. She carries six 21-in torpedo tubes, and she is armed also with one 3-in gun and one machine gun. 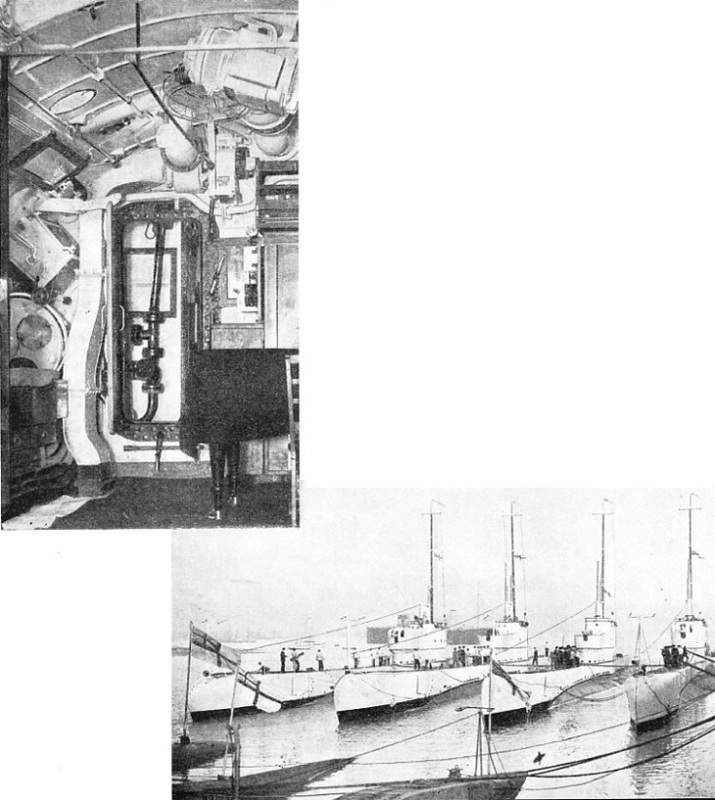 THE WARDROOM (left) of a submarine, clearly showing the watertight door. Below are four “P” class ocean-going vessels laid down in 1928 under the 1927 estimates. The vessels have a surface displacement of 1,475 tons, a submerged displacement of 2,040 tons, and dimensions of 260 feet by 28 feet by 133½ feet. Designed surface speed is 17½ and submerged speed 9 knots. The complement of these submarines is fifty. The armament consists of one 4-in gun, two small guns and eight 21-in torpedo tubes.